IN A BUZZING COFFEE shop on a chilly Los Angeles evening, a young pastor and his two companions make the fateful decision to leave a life of ordinary and embark on a quest that will change the course of history. Arising from the shadows, an ancient conspiracy challenges the trio’s best efforts, drawing them into a web of political intrigue and murder. Apocalyptic events unfold relentlessly as a global coalition mounts a final assault on the gates of hell. Could ours be the generation that fulfills the destiny of history? Will ours be the last generation—the one that welcomes Jesus’ return? 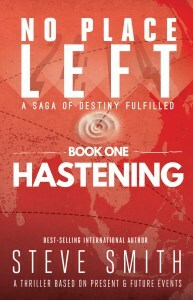 Hastening is the first book of the two-part No Place Left saga, inspired by actual events—past, present, and future. It paints a vision of the future, and how every Christian can leave a life of ordinary to join the quest. Could this be the real story unfolding in our world? Hastening begins a two-volume saga that could do for mobilizing the church what Steve’s earlier book, T4T, did for multiplying new disciples and churches. I commend it to you with great enthusiasm! Everyone loves a well told thriller! I do, and so does Steve Smith. He has woven a beautiful tale in this fictional telling of real life drama. The pace and passion in Hastening helps get the message across—with impact. It’s a must read! Christians who enjoy reading something wholesomely different will find Steve Smith’s mystery novel both informative and strategically focused on current challenges facing Christ’s kingdom-builders. You may find it a bit jarring. Most of us need to be shaken up once in a while to keep focused on what Christ has commissioned His followers to do. If you’re interested in missions, Asia, and political intrigue, this book has them all! Having lived in Asia as a missionary myself, I enjoyed the missions parts best. A good book for getting people “hooked” on missions in a non-threatening way!